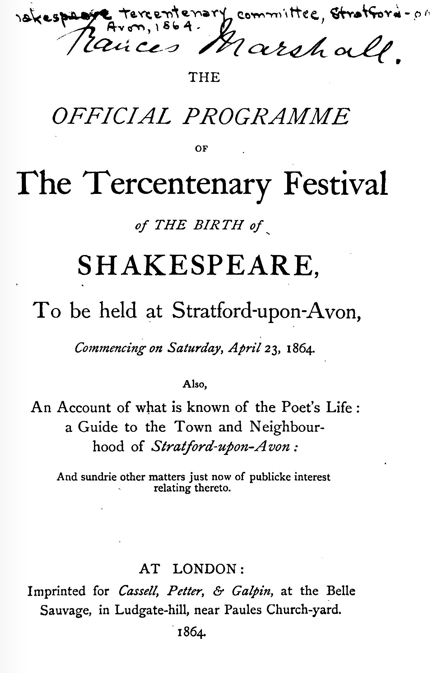 Of course the homage to Shakespeare should be universal, yet it does not mean “that each city and each town should on this occasion have a festival of its own”, The Official programme of the Tercentenary Festival of the birth of Shakespeare to be held at Stratford-upon-Avon declares: faraway places like the colonies or America are entitled to their own celebrations, but at home, “there should not be a thousand petty, but one magnificent altar”, in the town of his birth and death, “hallowed by his birth – hallowed by his sepulture”. The festivities in Stratford are to begin on Saturday 23 April at noon and end with a public ball on Tuesday 2 May, but by general request two more evenings are added, with performances of a tragedy and a comedy “by first-class Artistes of Metropolitan and Provincial celebrity”. The programme includes a banquet, presided over by the Earl of Carlisle, and fireworks, visits of the sites, Shakespeare sermons in church, plus a few performances of Shakespeare’s plays, beginning only on the fourth day of entertainments. The people of Stratford, who had to pay if they wanted to watch their betters toast Shakespeare, were reminded by angry pamphlets that he was “the Poet of the People”, and encouraged to form a rival committee and organize their own celebrations. One of the main organizers was the Stratford brewer Edward Fordham Flower, who was also the town’s mayor. His eldest son, Charles Edward Flower gave land for the site of the Shakespeare Memorial Theatre and most of the money to build & equip it. It opened in 1879 and ever since the family has filled the chair of the Board of Theatre Governors. Its present occupant, Sir Fordham Flower, is also chairman of the Shakespeare Birthplace Trust.